Since 1986, Village Auto Body has repaired, repainted and restored many vehicles in Bergen County, NJ. Our auto body repair shop is conveniently located in Ridgewood, NJ and we perform our auto body repairs promptly. Our expert auto body technicians are committed in auto body repair, automotive painting and suspension repairs for a majority of car models that are on the road today. We provide our own towing and flatbed service to transport your vehicle anywhere to our auto body repair shop in Bergen County NJ. 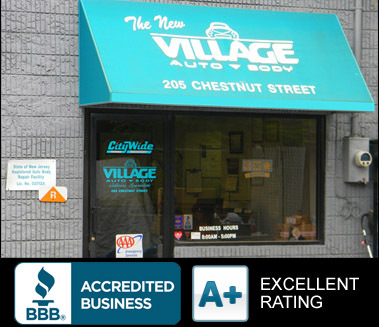 At Village Auto Body of Bergen County, New Jersey, we are certified by the Better Business Bureau for our expert auto body repairs. We are affiliated with Enterprise-Rent-A-Car and will arrange car rental services for our customers if needed. Village Auto Body is proud to be in good standing with the BBB and a member of AAA's Motor Club Towing Service. Our auto body shop specializes in collision repairs for foreign manufactures Audi, Mercedes Benz and domestic vehicles Chevrolet, GM and Ford models.